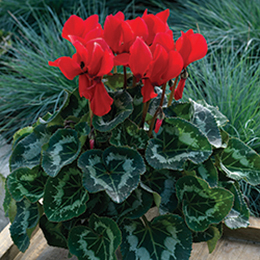 Our Mesa Magic™ Cyclamen Collection enchants your senses by offering the highest quality young plant production combined with a complete selection of genetics and sizes. It’s no illusion—true RELIABILITY, EXPERTISE AND QUALITY. All series are F1 hybrids. See Mesa Magic Cyclamen Program terms. Non-listed items may be ordered. See Custom Propagation services. Minimum of 5 trays per variety, per ship week. Please allow additional two (2) weeks to process.